It's been a CRAZY coupla weeks and I have so much to report! 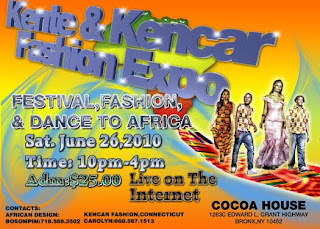 Come out to the Kente Cloth Festival party hosted by KenCar Fashion Magazine tonight and I'll fill you in on all the deets. If you can't make it out, they'll be streaming it live on the internet, so check it out and watch me do my very bad rendition of the adowa. My sister-scribe, the genius Ayesha Harruna Attah will be in the house autographing her brilliant novel Harmattan Rain which was shortlisted for the prestigious Comonwealth Writers Prize so come support two authors and get your dance on too. 3) and cheering on Ghana's Black Stars in this afternoon's World Cup game!!!! USA, you know I love you, but I'm rooting for the Black Stars today. My Mother Just Set Up a Reading For Me! My mother was at the Borders Express in Green Acres Mall yesterday afternoon and asked for a copy of Powder Necklace. When the manager led her to the book, Mommy proceeded to let her know she didn't like where it was placed in the bookstore; then she suggested I do a reading. Then my mom called me at work and put the manager on the phone with me to firm up the logistics! I'll be reading on July 10th at 2pm. If you're in the Queens, NY/Valley Stream, Long Island area that day, come through!